La Table de Chaintré (1 star Michelin) is located in the center of Chaintré in the picturesque Mâconnais wine region. It is consistently delivering excellent and innovative dishes. This beautiful restaurant is a gem and a family affair: Chef is Sébastien Grospellier and his wife Floriane is the front of house manager. We talked to both of them after the lunch and visited the kitchen. Le mot de l'inspecteur Michelin: Un restaurant élégant et contemporain, au coeur du vignoble de Pouilly-Fuissé, du rouge cardinal sur les murs, de beaux produits du marché aux couleurs délicieuses, des recettes plutôt tendance, un menu unique renouvelé chaque semaine... Le tout accompagnée de beaux nectars de Bourgogne et du Beaujolais! Wine Tastings, Vineyards, in France: This is about an outstanding restaurant sitting at the northern tip of the Beaujolais, in the village of Chaintré. There aren't many businesses in Chaintré, but gourmets and vignerons drive there because the food and the wine list are just excellent and every detail is perfect. The venue was long time ago a grocery store and it was turned into a restaurant by the previous manager of the place, Gérard Alonso. Sébastien Grospellier has worked previously in several high-end restaurants, with chefs like Joël Rebuchon, Jean-Paul Jeunet and Bernard Loiseau (he was working in the kitchen when he learnt about his tragic death). He quit his job as chef at Lisbon's Four Seasons in Portugal when he was told by Alonso that the restaurant in Chaintré was available. He moved in in 2007 with the goal to serve fresh products in a single menu that he would source himself, including the bread, which he makes at the restaurant. La Table de Chaintré is closed on monday and tuesday so that Sébastien can go to the market in Lyons and buy there the best products for the week. He works in the kitchen with an assistant (here Nobu from Japan) and his wife Floriane takes care of the service. In much less time than usually needed, he got a star on the Michelin guide. The village house where the restaurant sits is already very nice, with strikingly-pure lines, made with this beautiful type of stone found in that part of the Maconnais. 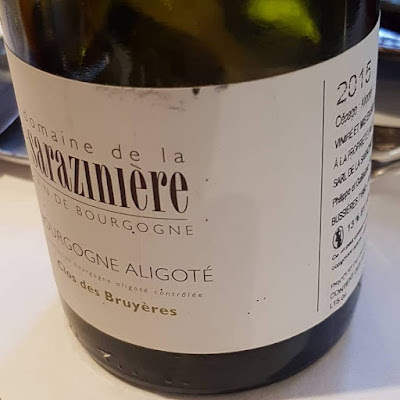 Although Chaintré is just a village at the crossroads of Maconnais and Beaujolais, the clients come from a wide range of places, like Lyons, Switzerland (which is 45 minutes away), Burgundy, Jura (very close too). The divided highway next to Chaintré (5 minutes) makes it very easy to commute to. Sébastien Grospellier is a native of the region and even if he enjoyed working in other regions and abroad, he kept this particular place in a corner of his mind. He knew the Alonsos well, he used to come here regularly as a customer himself, and when it was for sale, he went for it, even though he wasn't looking for a restaurant then. This said, the restaurant had already gained some fame in the region, for its food as well as its wines, and he hadn't to build up the thing from scratch. He just made a lot of renovation, and the dining room was his design. There is one single room in the restaurant, with an elaborate ceiling design which brings a soft light on the tables. Speaking of the tables, just enough seats for 25 people, because Sébastien Grospellier want to keep it this small. Floriane Grospellier, Sébastien's wife, does all the service by herself. On the kitchen side they have trainees from time to time. The cuisine is centered on fresh products selected from the best producers for the fish, the meat and so on. Then every tuesday he drives to Lyons to buy fresh vegetables and fruits on the market as well as grocery products. He also buys special vegetables from Annie Bertin, an organic grower from Brittany who supplies demanding customers or restaurants throughout France. At la Table de Chaintré there's a single menu named le Menu Découverte, for both lunch and dinner. There's no menu à la carte but this menu Découverte changes every week, along with the seasonal products found on the market and among his suppliers. They do have a formula for weekdays' lunch with entree plus dish but most people choose the menu Découverte because that's the whole concept of this restaurant and that's why they came here. 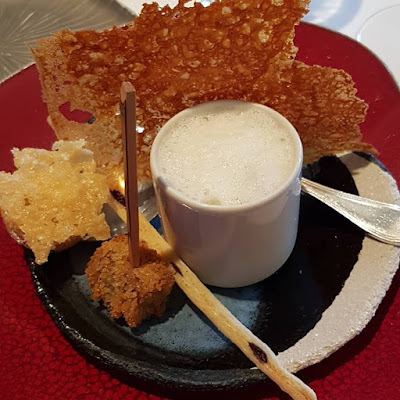 The menu Découverte is a collection of successives dishes, about ten in all, starting with appetizers and entrees, then two dishes, one with fish and the other with meat, and cheese and desserts. You feel like you're having all these gustative experiences one after the other each one so refined and tasty. For example these days it's the truffle season and you find truffles in several of the dishes. The wine list is in line with the freshness and quality of the food, I'll not list all the wines there but be ready for finding the best of artisan winemakers in the wine book, and this not only from Beaujolais but from all the French regions, randomly-picked names being Schueller, Prieuré Roch, Romanée Conti, Cossard, Valette, Anne Gros, Raveneau, Dard & Ribo, Jambon, Anglore, de Montille, Mugnier, Yquem, Chateau Margaux, Le Puy (yes, there are a few Bordeaux...) and many others... The wine list (extract) is not divided in white and reds but listed by producer, a letter ("b" or "r") indicating if it's a white (b) or a red (r). Makes more sense to me, the winemaker being more important than the color, and when you look for a particular vigneron, you may switch color when you fall upon another wine you didn't expect to see. Speaking of wines, Sébastien Grospellier learnt a lot about them when he worked for Jean-Pierre Jeunet in Arbois, through his friend Stéphane Planche who is caviste there and who runs Les Jardins de Saint-Vincent, an online organic wine portal. From this time starting in 1999, he visited many vignerons in the region and further, and he knows personally 95 % of the people you find in his wine list. His own philosophy on the kitchen side, with no technological tricks, no substitutes or ready-made frozen products, makes him feel very close to all these people who don't correct their wines with additives. Like himself, they also like good food and partying, and he regularly shares good moments with them, either here in Beaujolais or in their own region. During the time he spent in famous Michelin-starred restaurants, he didn't see this same passion for wine, the sommeliers there being formatted by the mainstream wine-tasting schools where the attention is centered on prestigious labels and appellations, more than on the grower/winemaker's craft.